Imagine a stylish cup of genuine hot chocolate perfection before you. Silky and smooth, with the mouth-watering level of thickness, and the right touch of sweetness. it is “what kids drink”? Are you looking for the vegan options? Do you prefer it sugar-free? Do you believe that hot chocolate is not what Paris is famous for? Hot chocolate is not an average guilty pleasure. It is healthy too! Researchers found that hot chocolate contains more antioxidants than wine and tea. They suggest to drink hot chocolate to reduce the risk of heart disease, cancer, and to slow ageing. Thanks to antioxidants (flavonoids) hot cocoa helps us to improve thinking. If you were wondering why you feel so good after a beautiful hot chocolate cup – flavonoids again, that’s why. These antioxidants help us to relax. That makes hot chocolate pretty serious stuff! The classic version of the French Chocolat Chaud is rich, smooth, and amazingly indulgent. It is made from the top raw ingredients. Drink it to make better decisions, to give yourself an energy boost, or simply to enjoy. Sip it in a cosy Parisian café to deeply relax. Have it on the go to keep yourself warm when it is wet and greyish outside, and when the temperature is low. Or give a touch of chocolatey sweetness to your perfectly bright and sunny day. The neighbourhood of Marais is packed with some extraordinary hot chocolate options. You can have it light, dairy-free, and no sugar. Or try the variety of traditional versions. 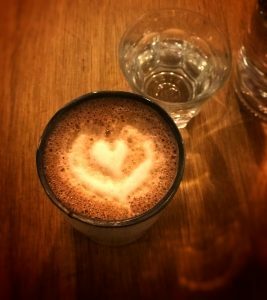 Here is the list of some of the best places to enjoy the delicious chocolat chaud in the area of Marais in Paris. A creamy Japanese-style hot chocolate comes with or without whipped cream on the top. On some days they offer hot chocolate in sensational Japanese flavours. Will you be tempted by Mirin (a rice wine ganache) or Chai Latte? This smooth hot beverage in a delicate milk chocolate colour can easily persuade you of its health benefits. While they lovingly prepare your hot chocolate behind the curtain, have a look around this tiny gourmet chocolate boutique. The displays contain elegant chocolate sculptures, cakes, and of course ganaches and pralines. The luscious items range in flavours from hazelnut and vanilla to matcha green tea, sesame, chai, and soy sauce. Emiko Sano, the Japanese owner of the shop might tell you the story of her grandfather. He opened a chocolate factory in Japan to make delicious chocolates and sweets with love and passion. Along with the secrets, he passed his love for the chocolate perfection to his grand-daughter, Emiko, who founded Les Trois Chocolats in Marais in Paris. Here you get a cup of a perfectly molten hot chocolate, a blend of the Japanese tradition and the French savoir-faire. Sip it from a classy craft coloured disposable cup filled with ultimate sweetness and love. A place to be for hot chocolate lovers is Italian Amorino Gelato at rue Vieille du Temple. You probably won’t miss their hot chocolate dispenser continuously stirring really thick “cioccolata densa” (thick chocolate). Choose from ten rich flavours that include classic dark, milk, white, hazelnut, or deep caramel. This chocolate is so velvety and rich, it can be tricky to sip. Spoon the chocolatey goodness out, or use a crispy Italian wafer biscuit to dug it into your cup. Stay inside at the high tables to spot fashionable trendsetters walking along rue Vieille du Temple. For a final touch of a Parisian style, end your rich hot chocolate Amorino experience with an ice-cream macaron. Feel the warmth and lots of amore seeping through your cup. There’s one simple rule to follow when looking for a perfect hot chocolate in Marais: don’t miss GROM. You can trust people who FORBID the use of low quality cacao. Grom has a solid reputation all over the world for the ice-cream. Both the milk and dark versions are the perfect consistency and flavor. And you can also bring it out to the world! Explore the beautiful streets of Marais with a little cup of Grom chocolate to warm your heart and your hands even on the coldest winter days! Hot chocolate is so decadent and so comforting, but what if you believe that hot chocolate has too much sugar in to be satisfactory for making a hot drink? And what if you can’t stand milk? Check out these surprisingly delicious healthy options. Best coffee. Best music. Best barmen. Best bike outside. Best place to read a “real” newspaper. Fragments is regularly voted “ the best place to…” by Instagram and Internet communities. It turned out their hot chocolate is also a secret “best”! – Creamy if you look for more traditional sinful deliciousness. – Dairy-free, made from the highest quality cocoa powder and almond milk, if you like it healthy and light. It’s not over-sweetened, with a tiny touch of pepper that provides a surprisingly subtle heat. You may get some sneaky chocolate pieces in you mug, which make your drink very soothing. Enhance the pleasure with their gluten-free cakes. A painted heart on the top of your hot chocolate will surely help to put a sweet smile on your frost-kissed face. An indulgent, healthy, organic drinking cocoa. It is made from just two ingredients: raw cacao powder, and the choice of coconut or almond milk. You may ask for agave syrup to sweeten it up. If you rather enjoy the pureness of the high quality raw chocolate melted in the vegan milk of your choice, forget the sweeteners. The end result is a beautiful glass of well-balanced, pleasurably light elixir that fills your body with pure goodness, high in iron and magnesium. Customise your hot chocolate-ness with the tiny raw chocolate flakes. They add a lovely cocoa aroma and a rich chocolatey taste. They make this drinking chocolate delightful and so very good indeed. When in Paris, try the very best of Paris. It is time for the beautifully decadent Parisian Chocolat Chaud experience. This parlour-store is a temple of a rebel chocolatier Jacques Genin. Come here to admire the most remarkable and fine artisan chocolates. But not only. Jacques Genin store is a delight for design lovers. AD Magazine included this industrial-chic space nestled within a 17th-century mansion into the list of the “10 Best-Designed Chocolate Shops Around the World“. Step in, enjoy the spacious area before you are seated at a beautiful table to get your soothing chocolatey drink. Jacques Genin’s melted liquid heaven is served in elegant white china. It gets its luxurious richness from top-quality chocolate. Its butteriness comes from the whole milk. It is perfectly smooth but not over-the-top rich. This cup of chocolat chaud is delight and deeply flavorful. They can be shared, but they are so silky and smooth, you might want to savour them on your own. They source the best ingredients to handcraft the highest level rebel chocolates. They welcome you in a spacious, impressively designed place. Their service is highly respectful and discreet. For a true connoisseur’s hot chocolate, none other than Carette at the Place des Vosges will do. Savour the smooth molten chocolatey deliciousness of this authentic Chocolat Chaud. It is not too thick, velvety rich, with the right touch of sweetness. They serve it very hot in a silver kettle. You might want to slowly slurp it unaccompanied, or choose some of the exquisite pastries of your dreams beautifully displayed under glass right at the entrance. Everything is served on fine china in a Carette brand floral pattern. Carette at Place des Vosges is loved by fashionistas and Instagram influencers. You can find it on the top lists of most Parisian travel bloggers, yet on most days it is pleasantly quiet and uncrowded. It’s a good idea to come here if you look for the epitome of a good, old-fashioned Parisian chic. Enjoy one of the best-known hot chocolates in Paris while listening to the humming happy chatter of the visitors, and watching aristocratically looking Parisian crowd strolling through the arcades of Place des Vosges.